Fits Gibson/Epiphone les paul ect Electric Guitars. 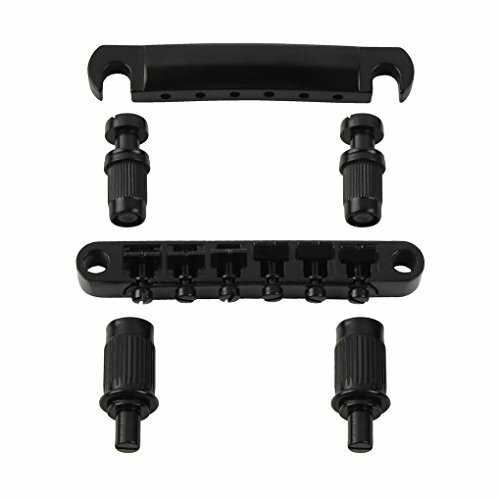 Bridge Mounting Studs and Inserts in Black for Floyd Rose Tremolo. 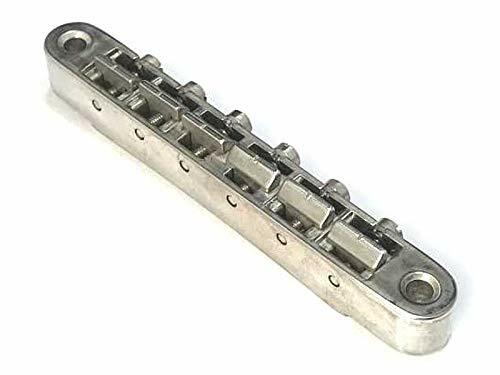 The Gotoh Tune-o-matic Bridge with Studs/Bushings is a modern version of the Tune-o-matic bridge for solidbody guitar.The metal saddles have helpful starter grooves to guide your slotting files. Intonation screws are retained by mini hex nuts. 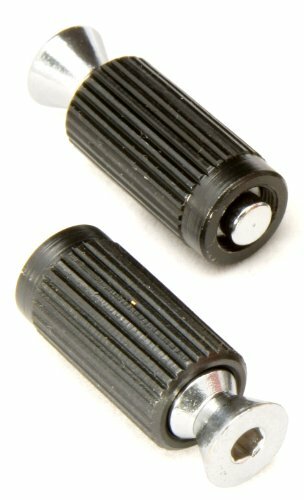 Includes threaded thumbwheel studs and bushings. Use an 11mm drill bit to install the bushings.Measurements:String spread: 2-1/16" (52.39mm)Saddle radius: 12" (304.80mm)Post spacing: 2-29/32" (73.82mm)Post threads: M8 x 1.25About bridge & tailpiece measurements:String spread is the distance between the centers of the outer strings on a bridge or tailpiece.Saddle radius determines the arc formed by all the individual saddle heights, and is similar to the measurement of a fretboard.Stud/post spacing is the distance between the centers of the mounting posts of a bridge or 'stop' tailpiece. The fittings and threads are all metric size. The post spacing is standard. It fit a Gibson SG perfectly. 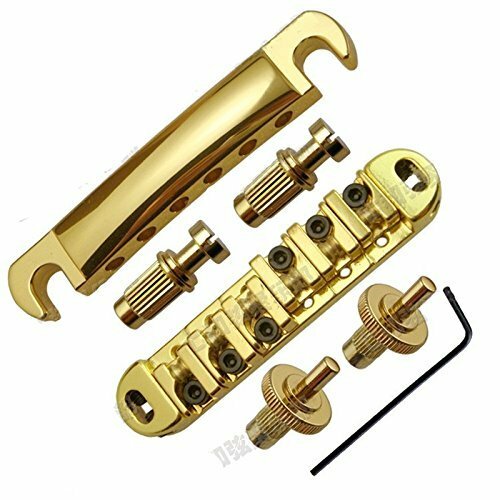 Roller Saddle Bridge and Tailpiece Fits Gibson/Epiphone les paul ect Electric Guitars. Tailpiece Size: Width (17mm) Length (98mm) Tailpiece Spacing between 2 studs (82 mm. from center to center) Bridge Size : Width (17mm) Length (84.5mm). String Spacing: 10.3mm Fully adjustable saddles for harmonics. with smooth working rollers. complete with locking posts. 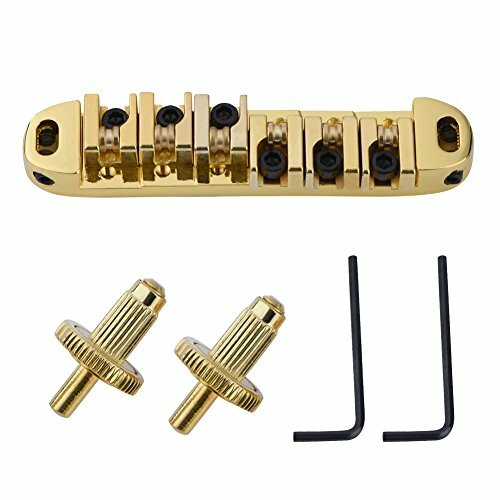 Package Includes: 1 roller saddle bridge & 2 studs 1 tailpiece & 2 matching studs. 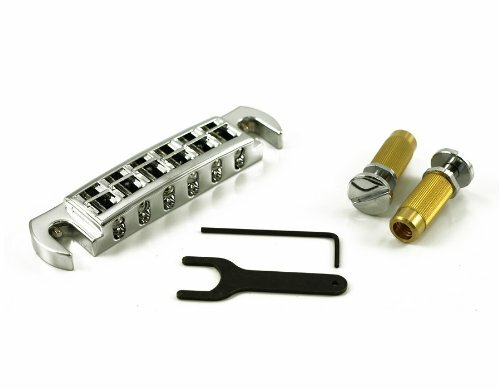 Genuine replacement mounting studs and inserts for Floyd Rose Tremolo Systems. Made in Germany. Hardware included.A modern version of the Tune-o-matic style bridge for the solidbody guitar. Pre-notched saddles with an individual saddle intonation screw retained by mini hex nuts for each one. 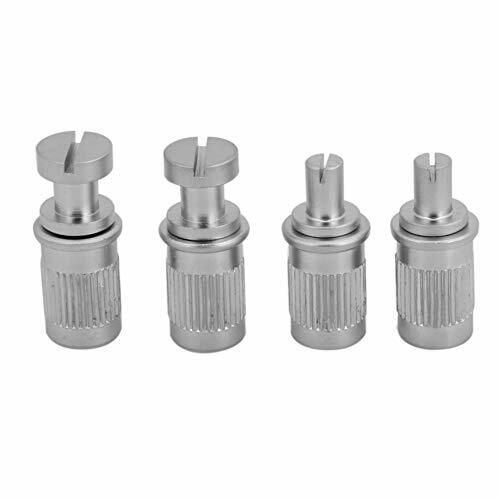 Threaded thumbwheel style studs and bushings and features hard zinc saddles. 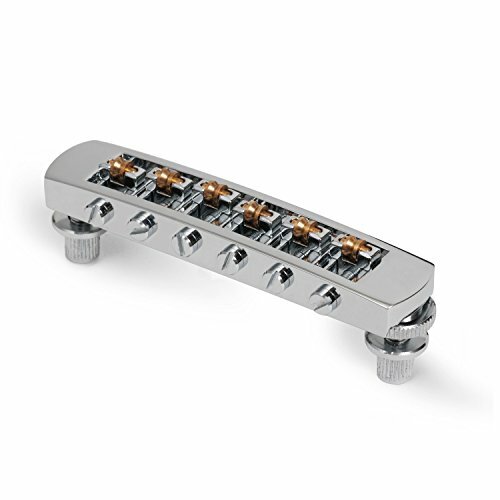 A modern version of the Tune-o-matic style bridge for the solidbody guitarPre-notched saddles with an individual saddle intonation screw retained by mini hex nuts for each oneThreaded thumbwheel style studs and bushings and features hard zinc saddlesHardware included. 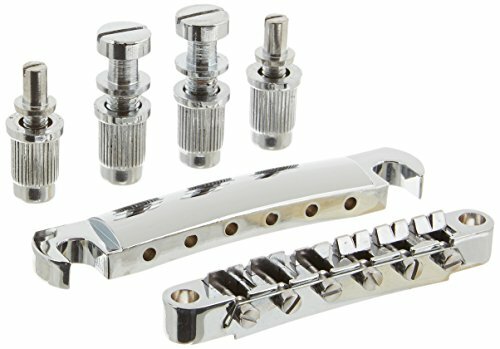 The Gotoh Tune-o-matic Bridge with Studs/Bushings is a modern version of the Tune-o-matic bridge for solidbody guitar.The metal saddles have helpful starter grooves to guide your slotting files. 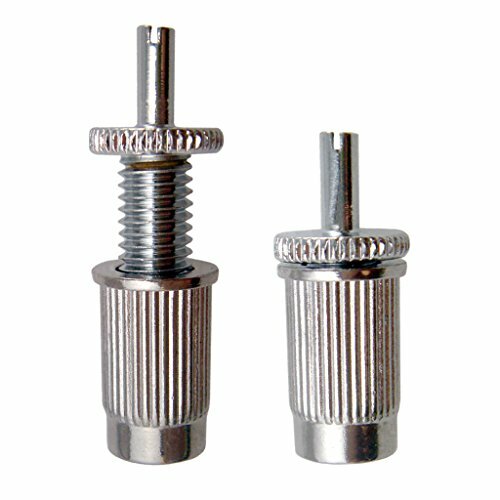 Intonation screws are retained by mini hex nuts. 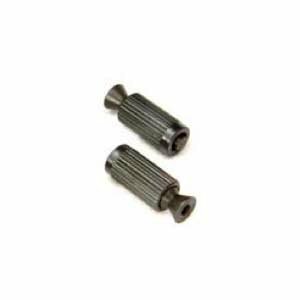 Includes threaded thumbwheel studs and bushings. Use an 11mm drill bit to install the bushings.Measurements:String spread:2-1/16" (52.39mm)Saddle radius: 12" (304.80mm)Post spacing: 2-29/32" (73.82mm)Post threads: M8 x 1.25About bridge & tailpiece measurements:String spread is the distance between the centers of the outer strings on a bridge or tailpiece.Saddle radius determines the arc formed by all the individual saddle heights, and is similar to the measurement of a fretboard.Stud/post spacing is the distance between the centers of the mounting posts of a bridge or 'stop' tailpiece. 100% new high quality and testing is fine Item 100% like the picture shown Fully Adjustable Durable black Finish Pre-Slotted Saddles Includes Studs and Bushings Stud Spacing: 3 1/4" Bridge Thickness at Stud: 1/4" Package Included: 1x black wraparound bridge tailpiece 2x posts We manufacture all kinds of instrument parts and conduct The direct model so that our price is very low with high quality. 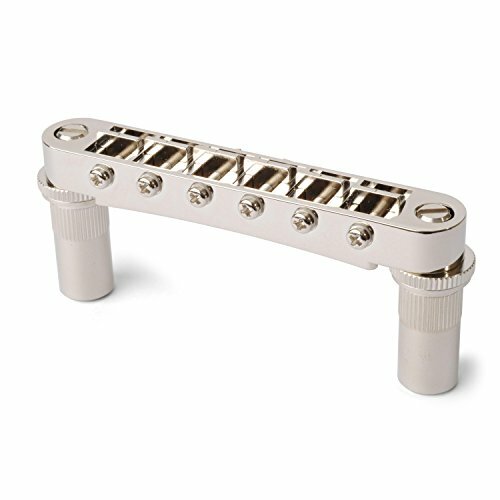 This is the only roller bridge that matches the 12" radius of the Nashville Tune-O-Matic. 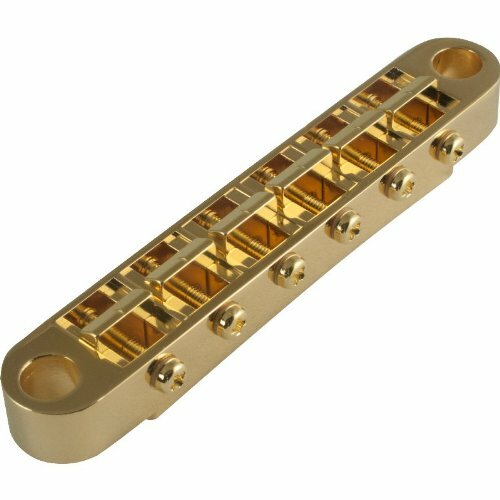 Low-friction brass roller saddles let the strings move freely and return to accurate pitch.We designed this bridge to work with Bigsby vibratos, in place of the Nashville Tune-o-matic. 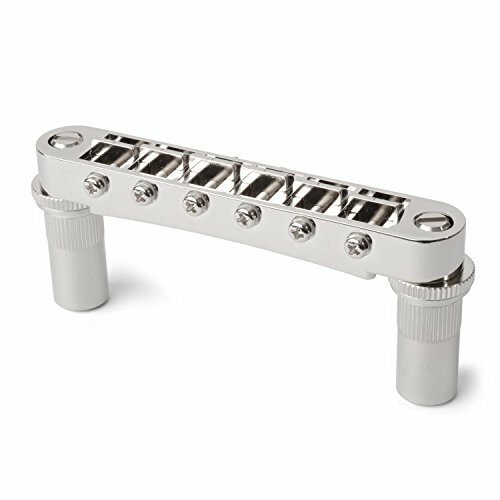 This is the only roller bridge that matches the 12" radius of the Nashville, so you maintain the string action you're used to. We gave it a low profile to keep the strings clear of the bridge body too, eliminating a frequent source of vibrato problems.Thumbwheel height-adjustment studs and knurled bushings are included.Specs:String spread: 2-1/16"Saddle radius: 12"Stud spacing: 2-29/32"Stud threads: M5 x .8About bridge & tailpiece measurements:String spread is the distance between the centers of the outer strings on a bridge or tailpiece.Saddle radius determines the arc formed by all the individual saddle heights, and is similar to the measurement of a fretboard.Stud/post spacing is the distance between the centers of the mounting posts of a bridge or 'stop' tailpiece.Bridge is made of plated zinc, with brass rollers. 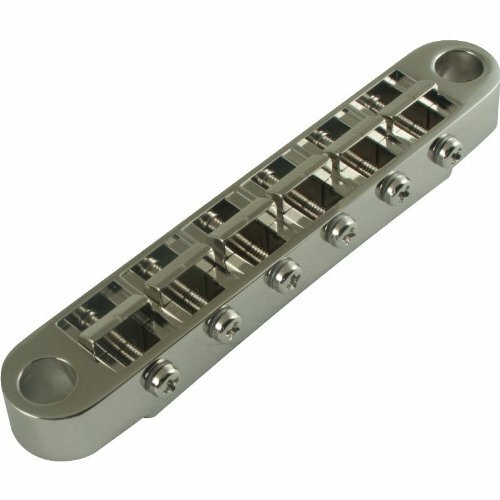 Guitar Roller Bridge is made of alloy construction, anti-corrosion and excellent durability. A desirable replacement part for your electric guitar, compatible for LP style 6 string electric guitar. 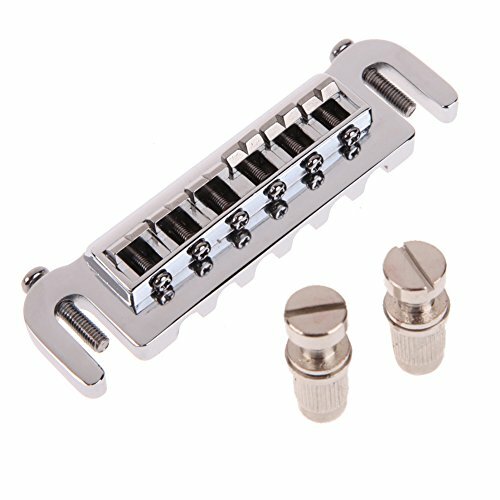 Features: PREMIUM MATERIAL: Guitar Roller Bridge is made of alloy construction, anti-corrosion and excellent durability. 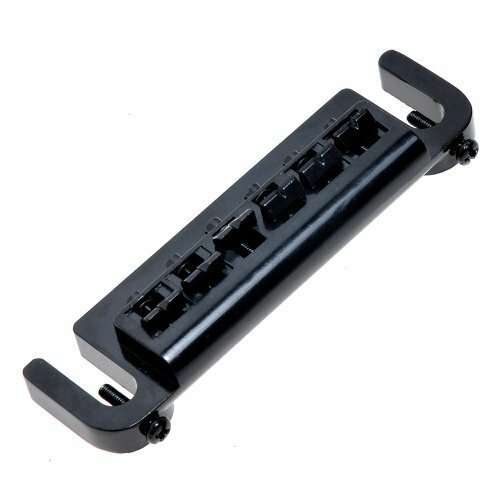 PERFECT GUITAR ACCESSORY: Desirable replacement part for your electric guitar, compatible for LP style 6 string electric guitar. EASY TO INSTALL: Supplied with studs and wrenches, easy to install and use. EXQUISITE DESIGN: High glossiness surface, good-looking and anti-oxidation. Three colors wait for you to pick. Specifications: Condition: 100% Brand New Material: Alloy Color: Gold, Silver, Black(Optional) Size: Approx. 84.5 * 17 * 12mm / 3.3 * 0.7 * 0.5in String Spacing: Approx. 10mm / 0.4in Weight: Approx. 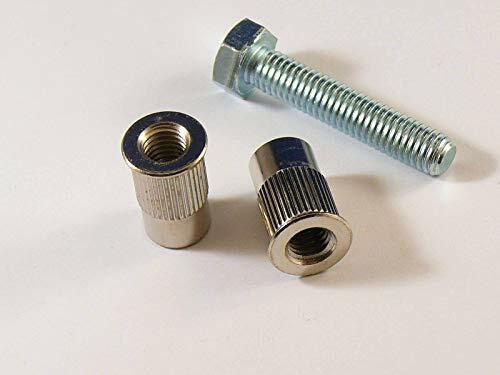 92g Packing List: 1 x Guitar Roller Bridge 2 x Studs 1 x 2mm Allen Wrench 1 x 2.5mm Allen Wrench Note: Please allow slight size inaccuracy due to manual measurement. We appreciate for your understanding. Description:*Regular tune-o-matic bridge and tailpiece for LP style guitar or similar guitar. *Come with 2 thumb wheels and 2 matching posts. *Size: The distance from the center to the center of the two post is approx.73mm. The distance from E to E is approx. 52mm. The Tailpiece String Spacing: approx. 10.28mm. *Material:Zinc alloy. 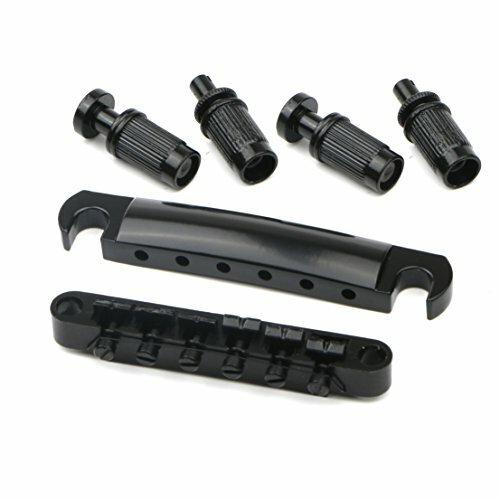 * Color:Black.Package Include: *1pcs Tune-O-matic bridge and tailpiece with studs. 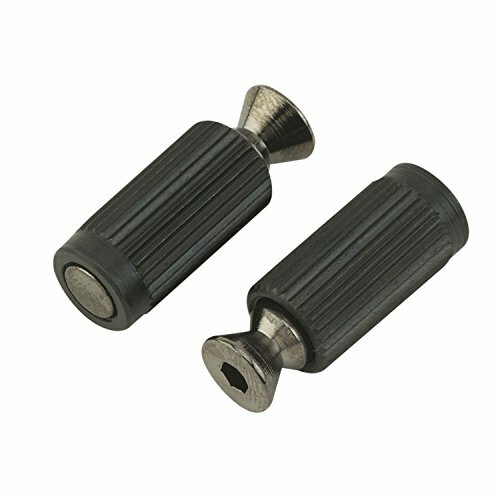 Compare prices on Bridge Studs at Elevelist.com – use promo codes and coupons for best offers and deals. We work hard to get you amazing deals and collect all avail hot offers online and represent it in one place for the customers. Now our visitors can leverage benefits of big brands and heavy discounts available for that day and for famous brands.